Tiki Totems 2! Now with twice the tiki action! It’s totally tap-tacular! Sorry, that was really cheesy, but I couldn’t resist. But seriously, if you were a fan of Spokko’s original Tiki Totems hit, then you should be excited for this fresh sequel, because although it’s roughly more of the same, everything has been nicely tightened up for this challenging but easy to grasp physics puzzler. The object of the game is generally pretty simple: get the Tiki idol down, but don’t let it touch the ground. There are various blocks stacked up in various configurations to hold up the idol, and each block has its own special properties. Plain wooden blocks simply disappear with a tap, but stone blocks are indestructible, and glass blocks need to be broken by other falling blocks. There are even mystical blocks that only disappear when they touch each other and special dynamite packs for when you need a little extra oomph to adjust your idol. As you might imagine, finding the proper order and timing to send everything on a carefully controlled collision course can take some concentration. For the sequel, two additional modes have also been rolled out. 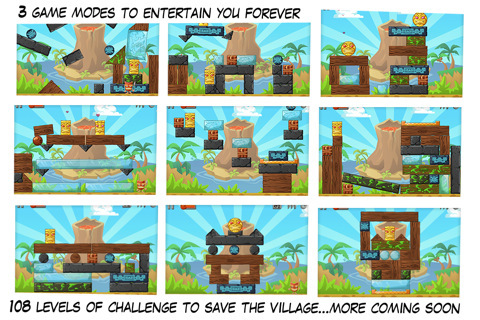 In Classic mode, you have to remove all blocks as usual, but Altar mode just wants you to get Mr. Tiki down to a special altar area, while Love mode introduces an adorable Mr. and Miss Tiki pair, where the object is to bring the two carved wooden lovebirds together without touching the ground. Also included is a fairly ugly, but completely functional and comprehensive level editor to create your own tiki madness. There’s no way to automatically share levels with your friends or online, but you can send them in to the developers, and they’ll select the best ones for future release. It’s not a perfect system, but moderating it this way means you want to have to wade through all the really awful and stupid user-created levels. Aside from the level editor, the graphics for the game are really quite charming and crisp, with a lot of character packed into a very small amount of story. The audio is good and the soundtrack is thematic without being too obnoxious, and finally, Game Center achievements help round out the experience. Overall, it’s a very solid sequel powered by the same excellent physics engine of the first game. It’s a fairly basic puzzle type, so don’t expect to have your socks blown off by its ingenuity, but for a quick five-minute fix, Tiki Totems 2 does a nice job of delivering a simple and satisfying little challenge. 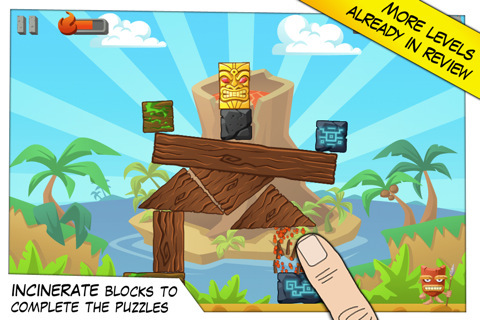 AppSafari review of Tiki Totems 2 was written by Tracy Yonemoto on December 14th, 2010 and categorized under App Store, Games, iPad apps, Physics Based, Puzzler. Page viewed 3573 times, 1 so far today. Need help on using these apps? Please read the Help Page.